It was Round Three and on paper it looked to be a difficult fixture, as we hosted the reigning Premiers at Hickinbotham Oval. However, we've since learned West Adelaide have not proved to be the powerhouse they were in 2016 and on the day we took the two points after a comfortable 71-point win. It was a tale of two teams heading in different directions. South now sit third on the ladder while the Bloods are now anchored to the bottom of the table and are enduring a tough 2016 campaign. Against West in Round Three, South set the tone early and jumped out to a four goal lead in the first quarter. The Panthers continued to build that advantage at every change, including a seven-goal-to-one third quarter blitz and ran away with the game. Brett Eddy, was the star on the day, bagging eight goals of his own and also playing a role in setting up numerous scoring chances for his fellow forwards. Ben Haren and Sam Overall also slotted three goals apiece. Jake Veide was once again released onto a wing and continued to show his outside game can be as devastating to opponents as his ability to lock them down at the stoppages. Back to sporting his signature shaved head, Jake's all-around performance included 24 touches, eight marks, seven tackles, seven inside 50s and he also led the Panthers in team positives. Goals were the highlight of the day, as the Panthers banked their highest score since their 2014 Semi Final win over Sturt at Adelaide Oval, eclipsing that 21.11 - 137 mark by a point. 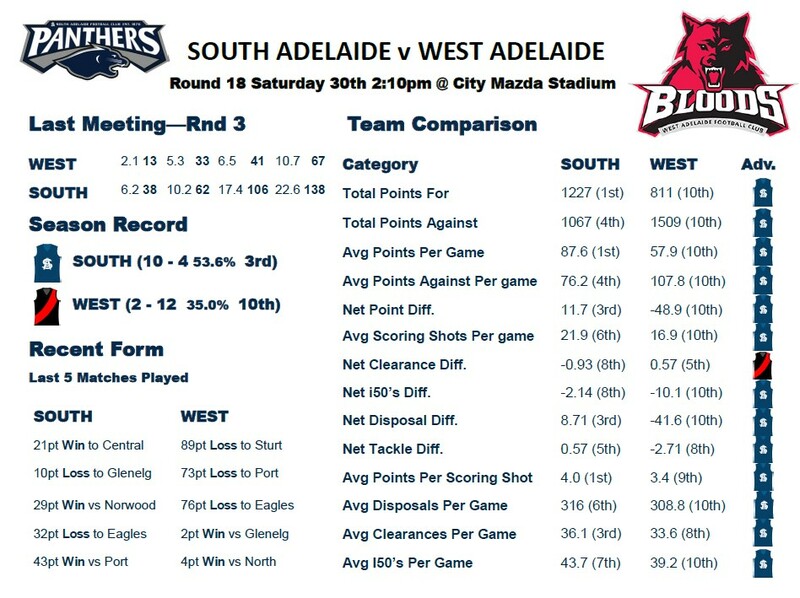 However, credit should also go to South's defence, who made a West Adelaide side that was the second highest scoring team in the SANFL in 2015 look ordinary offensively. Unfortunately for Bloods supporters, their side has been unable to regain the momentum and magic that saw them claim their first Premiership in 32 years. However, as the competition has seen in recent weeks, no win can be considered a sure thing and South will need to bring their A-game to take home another victory. Brad Crabb was forced to miss the Round 17 clash with the Bulldogs after being a late withdrawal with a hamstring complaint. However, the Panthers skipper will be hoping to make an immediate return and will be tested during the week. Likewise, Nic Schwarz (knee) and Nathan Daniel (concussion) will also be tested this week to see if they are available to play against the Bloods. Cameron Hitchcock returned to the Reserves side last week after suffering a hamstring injury all the way back in Round 10. The electric forward/midfielder put in a strong performance, recording 22 touches and three goals and didn't do his chances of getting a call up to the league side this week any harm. See the Panthers full injury list here. West Adelaide had two of their 2015 Premiership players return to the side against Sturt last week, in small forward Aaron Fielke (calf) and half-back Errin Wasley-Black (hamstring). However, West have been stung with a long string of injuries this season. Premiership defender Adam Hartlett, who announced his impending retirement from SANFL footy last week will have his injured calf tested during the week, while fellow Premiership players Nick Homburg (shin 1-2 weeks), Jason Porplyzia (knee 1-2 weeks), Aaron Anderson (knee season) and Ryan Willits (knee season) are all unavailable for selection. Stay tuned to safc.com.au on Thursday evening for the official Round 18 teams for all grades. Advantage South: On paper the Panthers look to have the wood over the Bloods in nearly all major statistical categories. The Bloods prepare to face the Panthers this week after coming off an 89-point loss at the hands of the league-leading Sturt, another disappointing loss in what has been a disappointing season for the 2015 SANFL Premiers. Meanwhile South Adelaide recorded its eighth win in a row at home in a 21-point win over Central Districts, our first win in 10 years against the Bulldogs at Hickinbotham Oval. Round 18 is another opportunity for the Panthers to fight for the top of the ladder, whilst the Bloods are fighting to get off the bottom. The top two teams, Sturt and Woodville-West Torrens face off this week at Maughan Thiem Hyundai Oval. This means that the top of the ladder may get even closer if South are able to come home from Richmond with a win against West Adelaide. Our team comparison above reveals the dominance up forward that South Adelaide have shown this season. Leading the league in Total Points For and Average Points Per Game despite being Sixth in Average Scoring Attempts Per Game. Although the Panthers will need to focus on making sure that they are winning the ball out of the clearances and getting the ball up forward so the likes of Brett Eddy, Sam Overall, Codey Ellison, Jackson McMahon and Rigby Barnes can continue to kick goals with the league's highest accuracy ranking. The Panthers will be looking to capitalize as they did in Round Three on their opportunity to face a lower ranked outfit and further advance their 2016 campaign. Last time these two sides met the Panthers dominated the game from start to finish, they controlled the possession count and finished the game with a +75 disposal differential. Although they will need to focus on winning the ball out of the stoppages as the clearance battle statistically shows a weakness for the white and blues. Although despite the gap on both the league ladder and within most of the statistical categories between the two sides, West Adelaide, especially playing at home are still sure to be a tough opponent. We have seen this season that unless you have a bye, there are no weeks off! So make sure you get out this weekend and support the Panthers on the road! We are nearing the end of the season and every single game is an important one.